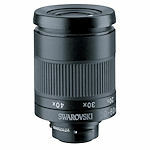 Swarovski offers two eyepieces to fit their ATS/STS/ATM/STM spotting scopes. Both are zooms: a 20-60x standard eyepiece and a 25-50x wide angle model. The wide angle zoom also provides a larger image so it performs better for digiscoping.